Some years ago when Calibrachoa (aka “million bells”) annuals were new to the market I tried some in the garden and containers. I don’t remember the particular varieties that I planted that year, but I do recall that they were a disappointment. Once it got hot they stopped flowering. “Why do people like these so much?” I wondered, and didn’t purchase them again. I also found this research by Erika Berghauer and Jim Barrett that explains that Calibrachoas do vary in heat tolerance and this is linked photoperiod. In other words, the length of hours of daylight can affect flowering in this genus… adding heat to the mix also produces variation in bloom. Here’s the long and the short of it… the flowering of Calibrachoa isn’t much different than anything else in life: things aren’t as simple as they initially seem. This reminds me, however, not to judge an entire collection of plants by how one particular variety performs. It also speaks to the wisdom of trying out a new cultivar to see how it’s been improved. Even the plant world is telling us to keep our minds open and not judge an entire group by how a single entity behaves. These "Lemon Slice" Calibrachoa bloomed continually for me even though the growing conditions last summer were all over the map. It was an unually warm June followed by a hot, dry July and a fairly cool August. Through all of these conditions this annual kept its cheerful production of white and yellow flowers. I'd plant this variety again in a heartbeat. Plant Calibrachoa in full sun. You can still have them bloom if they get a half-day’s worth of sunlight but they’ll be a bit more lanky and have fewer flowers. In a combination planting they will still hold their own, however, so don’t rule them out completely if you have only four hours of direct sun. Want to know how various Calibrachoa varieties perform? Check out this trial done at Pen State. You can see the ratings for each group of plants or arrange them by ranking with the highest or lowest rated plants listed first. Calibrachoa doesn’t do well in high pH soils. So if your garden is a bit on the acidic side, that will make this annual very happy. This annual doesn’t want to be kept wet. If you garden in areas where cold, wet spring weather is typical, you might want to check the forecast before planting. If days on end of rain are predicted after you’ve purchased plants you might want to keep those plants in pots on a covered porch for awhile before planting. They’ll be fine in their pots if kept outside where it’s cool for a week or so but in a location where they’re not constantly watered. Don’t plant Calibrachoa in a garden that’s getting hit daily with automatic irrigation systems. Set your irrigation to go off for a longer period but less frequently so that the surface of the soil can dry out in between waterings. 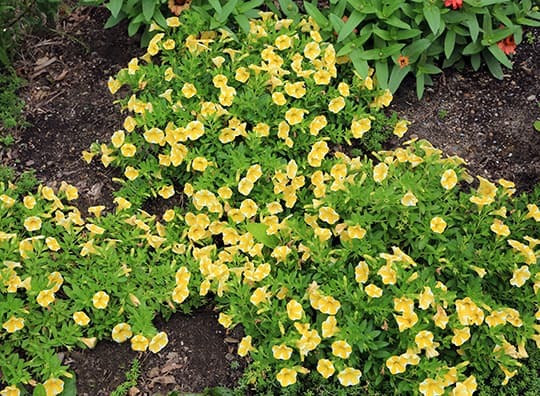 Plant Calibrachoa with a combination of a time-release fertilizer that has a fairly high level of nitrogen, combined with an equal amount of an organic fertilizer. By working these two into the soil before planting you won’t have to feed the rest of the summer.